Smart Short Courses (est. 2004) welcomed over 5,000 participants and over 650 speakers during 95 different technical short courses. 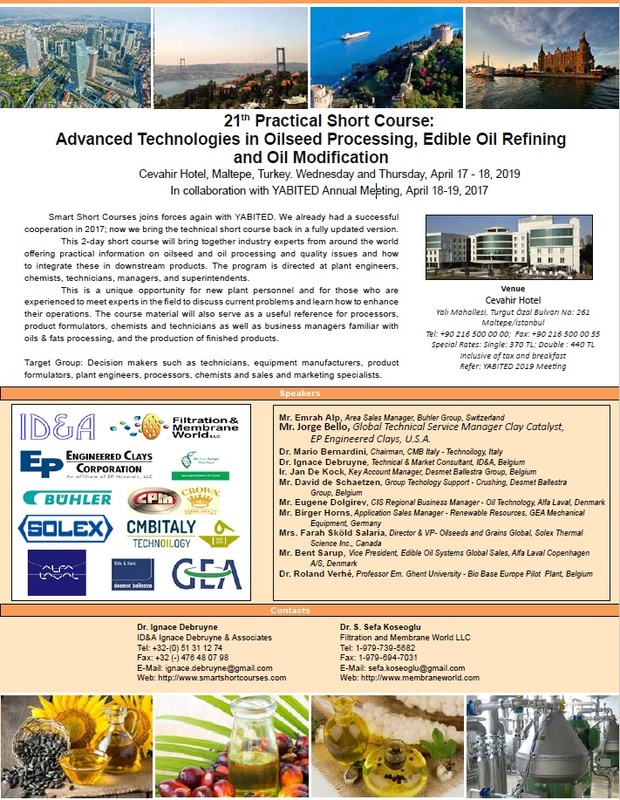 Smart Short Courses is a joint operation of ID&A Ignace Debruyne & Associates and Filtration and Membrane World, represented by Ignace Debruyne, PhD and Sefa Koseoglu, PhD. Smart Short Courses offers crash course programs for marketing, technical and plant personnel. Short courses offer the opportunity for those who are experienced to meet experts in the field to discuss their current problems and enhance their product innovation or plant operation. The course materials serve as useful reference for processors, product formulators, chemists and technicians, as well as marketers and business managers familiar with the topic. Target Group: Decision makers such as product technicians, R & D engineers, engineering supervisors, QA technicians, project engineers, process improvement engineers, business development managers, sales and marketing specialists, equipment manufacturers, product formulators, plant engineers, processors, chemists, and technicians.